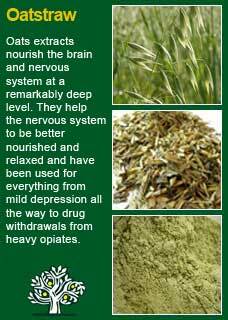 Herbal medicines have been used by all cultures throughout history for the simple reason that they help. 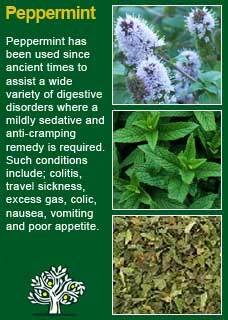 Certain herbs are renowned at improving the general health of a woman during pregnancy and what can be seen is that, as well as being extremely safe, they share a quality of being exceptionally nourishing. 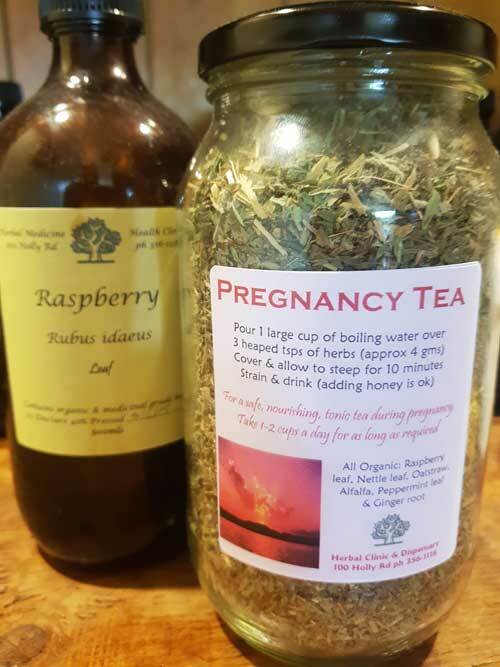 A combination of herbs in either a tea or a formula can be generally recommended, shown here in the 'Pregnancy Formula & Pregnancy Tea', they can do a great deal to support the internal health of both mother and baby in many regards. 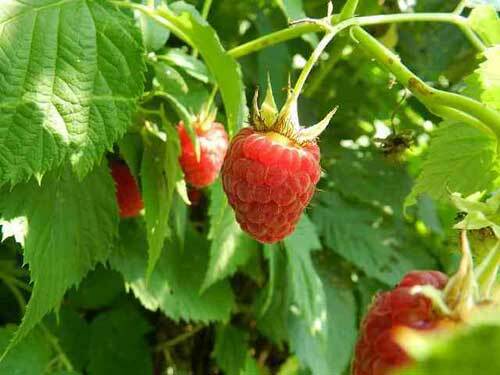 The above liquid extracts can be combined into a formula to make 560mls. This will just fit in to a 500ml amber pharm round bottle and is enough to last 8 weeks, approximately two months, if taken at a strong dose 10mls once a day (or 5 mls twice a day if this is preferred for any reason) This is, no doubt, a high dose, but these herbs are extremely safe, the amount of ethanol is completely negligible and these are herbs that need to be taken in robust amounts to bring their actions and ingredients to where they are needed. 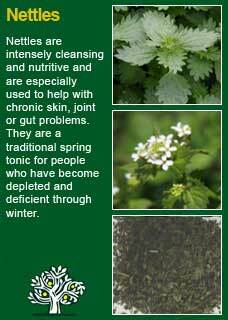 Raspberry leaf, Nettles, Oatstraw and Alfalfa are 4 of the most blood, skin, bone and tissue nourishing herbs on the planet. Any pregnant woman will benefit greatly from some or all of them. 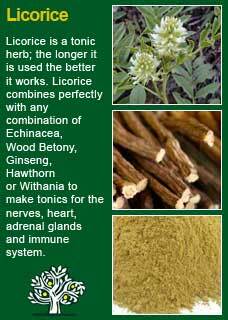 The Licorice and Ginger are there for their own manifold virtues and to make the mixture easier to take (Licorice) and more easily digested and absorbed into the body (Ginger) If a woman had an aversion to Licorice, or if she had blood pressure that was clearly too high, the Licorice could be well substituted with Peppermint or Chamomile extract. 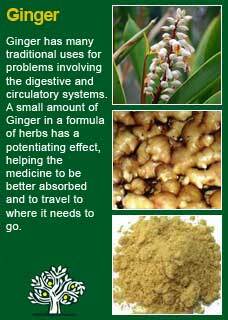 Likewise, if she just did not like Ginger, it could be left out or substituted with Peppermint or Chamomile. The amounts given above would approximately fill one large, 1 litre jar and this sample of a Pregnancy tea could easily be adapted to individual needs or preferences and if, as often is the case, a woman was very particular about how things tasted in her pregnancy, it might be wise to get the dried herbs separately and then to experiment with using more or less of them until a combination was found that gave the most agreeable flavour. For example, some women might want much more or less Ginger, if any at all. 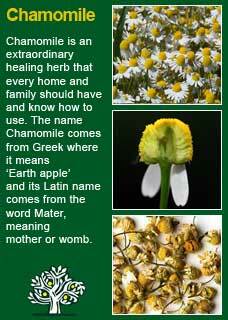 Some might like to add some Peppermint or, equally, some Chamomile to adapt the flavour of the tea. Whatever the blend, steeping about 3 heaped tsps (approximately 4 gms) of these herbs in one large cup of freshly boiled water for a good 10 minutes will extract all their virtues and will make an excellent daily tonic for pregnancy. If the woman enjoyed the tea and wanted to make more than one brew of it a day there would be no possible harm but rather every likelihood of further benefit. 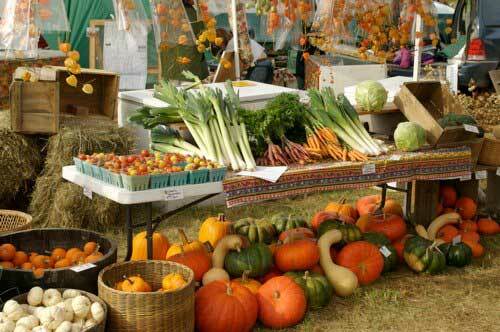 There are two areas of diet that are most important for a healthy pregnancy. The first is to stay well hydrated. 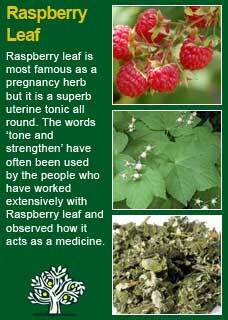 The body makes a great deal more blood, and other tissues, during pregnancy. If we do not increase our fluid intake accordingly, we can settle into a chronic state of mild dehydration and just not be aware of it as our system becomes accustomed to running dry. So how do you know how much water (or cups of tea etc.) you have to drink? Listen to your body. If you are able to go more than 2 hours without needing to have a decent 'pee' you are dehydrated. If you are needing to go more than once an hour, you are overdoing it and unnecessarily stressing your kidneys. A good outflow every 1-2 hours is the sweet spot and to get into that zone you will need to vary your fluid intake according to the weather, the humidity and how active you are. 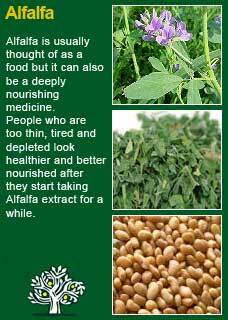 The second area is to make sure you are getting enough proteins and fats. Sugar is essential for energy (though many people eat more than they need in the form of bread, pasta, rice etc.) but protein and fat are most essential for the growth of your baby and the adaptation of your own body to the growth of the pregnancy.